Today is 24 July 2006. All day thinking about tomorrow. Because tomorrow I will be 50 years! Wow, a half-century behind! And what have I done in 50 years? I guess all the people who have reached this age, you become sentimental and begin to make a reassessment of values of all life. Happy or sad? The feeling is not clear… The only thing that upsets and upsets me is that I am not currently with my family, not with my friends, but far behind the equator in the southern hemisphere. Actually, I have a tradition: not to be at home on round dates. So, last year, when I traveled to Africa, my wife Natalia and I had a wedding anniversary – 25 years together. On the morning of 25 July woke up and I already had the phone two messages of congratulations. My sons Dima and Denis were the first to congratulate me. During Breakfast, I was congratulated by the owners-Carmen and Sorin (they come from Romania). They gave me a present and told me that Breakfast was at the expense of the hotel. Thanked, sat on the bike and went to the ocean to watch whales. 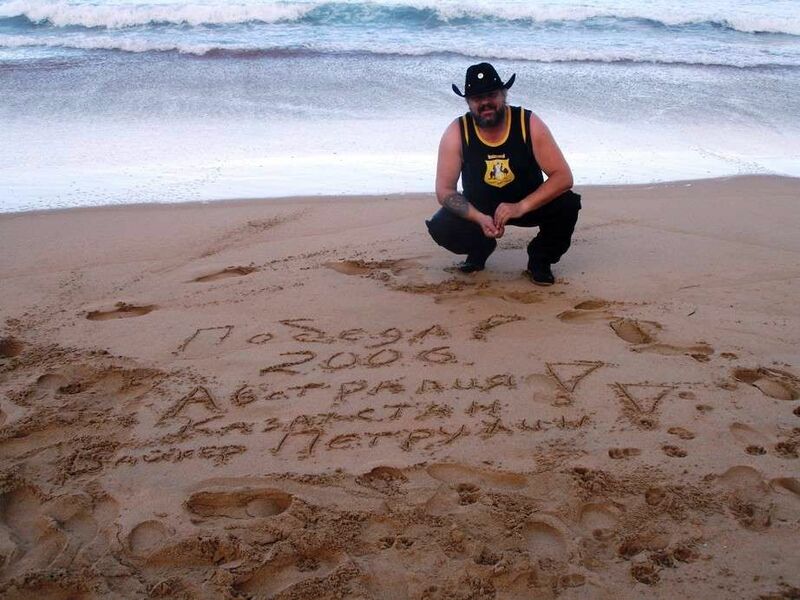 I first saw the Pacific ocean so close (above it I flew from America to Vladik), so I immediately wrote on the sand: “Kazakhstan – Australia. Victory. 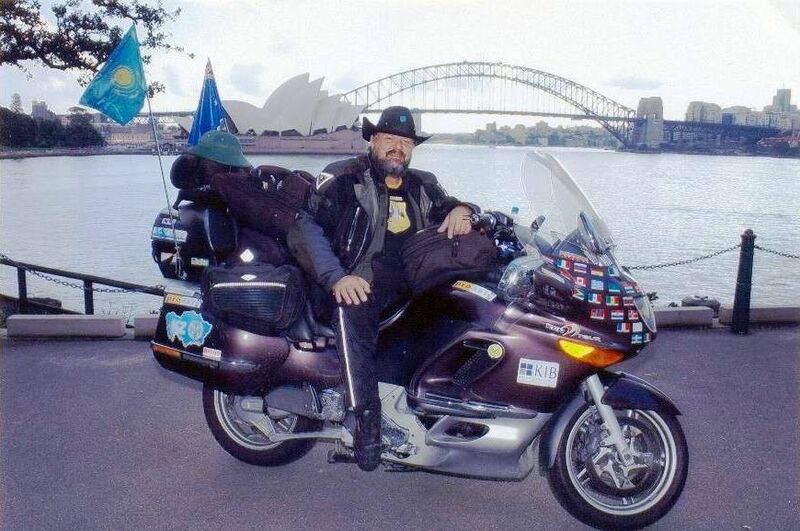 Biker Petrukhin”. Barely had time to run back as the tide washed them away. I photographed the surfers (which on the water and ride on the boards). Went to the motorcycle, but already there is sea gulls. Pulled bread and cheese out of the trunk and began to feed them. A lot of calls and messages come to my phone. Got a call from the wife, friends. Got a call from the foreign Ministry Antonenko, Andrey Ivanovich (still able diplomats to find words! ), says, come, isn, dare, because the real life is after 50. Did not notice how the Seagull got my “slo-mo”. God be with them, it’s my birthday present to them. I have often journalists ask what the meaning of life, and somehow I came up with the answer. I think that the meaning of life is that a person lives and performs good deeds for the benefit of the people. This is the meaning I understood from the many responses of my friends and just people who are good with words and with the big heat respond about my ride, as for the image of our country and for all people in the world who value peace and friendship on this earth. I got a call from Sydney – from the AIF in Australia and Horizon editions, as well as from ITAR-TASS. Congratulated, said that waiting for the meeting in Sydney (seen the Russian Ambassador take care). Nice! In-General, the day passed in congratulations. Thanks to everyone who forgets me and remembers! Today I decided nowhere to go, and a little bit to celebrate his birthday with the Romanians, especially because they are just crazy fun with me. The next day, Sorin and I went to the Marina, and he rode me on his boat. He is also over 50, but he is very active and says that at home, in Romania was a champion in tennis. Then we went to the Park area where you can observe kangaroos, ostriches, koalas and other animals in the wild. With great difficulty we managed to take some pictures. On my wish to be photographed with a crocodile, Sorin waved the head and told that it happens only in movies. When they came home and I showed him my picture with the alligator, which I did in Asia, he gave me a memorable souvenir as a token of respect. However, it is time to know and honor. I think that our friendship will not end. The world is close! Here is how time on this subject, I will tell you next time. A very funny story.